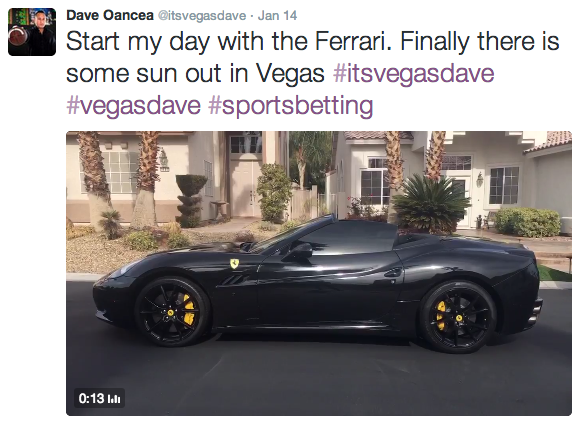 Dave Oancea, better known as Vegas Dave, is regarded as one of the elite sports handicappers of this era. His amazing career began in Las Vegas 15 years ago. Today, he is an acclaimed sports betting consultant and wagers over $100,000 a week on sports. Vegas Dave's success has attracted fans and sports betters from around the world. This journey has provided him with a great lifestyle and ﬁnancial freedom. Each year Vegas Dave gives back to various charities in Hawaii, Las Vegas and other cities. Dave moved from Honolulu, Hawaii with the dream of making it big in Las Vegas. Dave took a $10,000 student loan while attending UNLV. He placed the entire $10,000 on red on roulette and doubled his money. 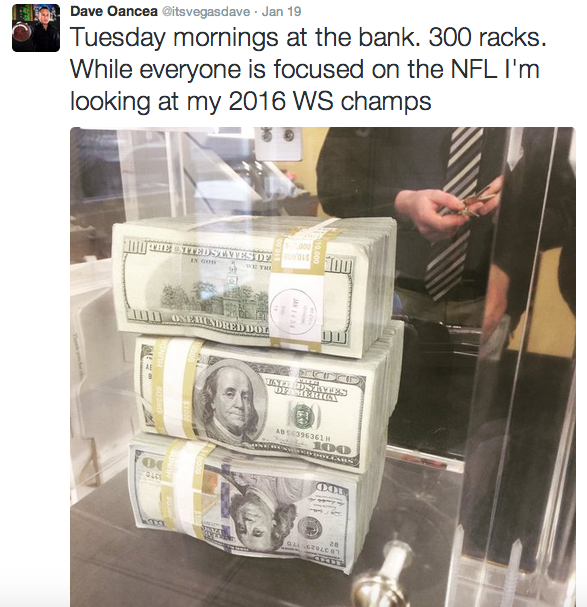 He then had the $20,000 bank roll to start his sports betting career. Over the coming years he had many ups and downs on his gambling journey. There were nights when he lost all of his money. He spent a two month stint at Gambler's Anonymous and even had to borrow money from his parents. However, Vegas Dave always believed he was destined to succeed in the sports betting world, but lacked money management skills and self control. He learned that to succeed in this line of work he needed a more disciplined approach. 1. In 2012 when the NFL playoffs started the Ravens were +800 to win the Super Bowl. They were the biggest long shot to win it all. Yet, Vegas Dave predicted the Ravens would win the Super Bowl. He bet $8,000 for a payout of $208,000. 2. At the start of the 2013 All Star Break, Vegas Dave predicted the Boston Red Sox would win the World Series at +1,000 odds. He put down $30,000 for a payout of $340,000. 3. One week into the 2015 season, Vegas Dave predicted the Kansas City Royals would win the World Series. The so called experts chose them to ﬁnish in last place in the AL Central. Vegas Dave made history by placing a bet a little over $100,000 to 2.5 million. The highest paid future bet in sports betting history. 4. Just two weeks after his Kansas City Royals World Series win, Vegas Dave predicted Holly Holm would beat the undefeated UFC women champion Ronda Rousey at +1,100 odds. He placed a $20,000 bet and received a $240,000 payout. This set another record as the highest payout in UFC history. Dave had the chance to open up about his lifestyle to AOL Sports. Q: So you really got started by putting a $10,000 loan on red? A: Yup. My parents wanted me to go to college, but I hated school. So I figured I'd just go where the casinos were (laughs). So, I went to school, took the loan. Instead of spending it on books, I went to the Palms and put it on the roulette table. Q: What would've happened to you if you lost? What would you be doing? A: I don't know. I mean, who knows. When you're 23 years old, that's a lot of money. The formula, in my mindset, was that I didn't want to work a regular job. ... I don't know. Q: Getting that to $20,000 was a high point. Leading up to the insane success, were you ever down big or in a bad way? A: Absolutely. I tell everyone that before I became a pro gambler, I was pro loser. I was in debt and I checked into gamblers anonymous. I realized when I was in GA, I'd still check scores, and I learned to manage money. ... I learned how the books get you. When I realized I can manage my money, that's when it clicked for me. Q: In gamblers anonymous, did you think, in the long run, this was still what you wanted to do? A: I just did it to make my family happy. I hit rock bottom. I was good at what I did, though. I had a good concept of the games. I could always predict who'd win; I just couldn't manage my money. It was a wake-up call, that this was my last chance. Q: What was the positive thing that happened which got you on a steady path? A: Gamblers anonymous, they were miserable there. I didn't wanna be like that. I knew I was smarter than those people. I just had to grow up and have discipline with my money. It was that realization, that I'm good at what i do. Q: Did any stories scare you? A: Yeah. Your'e there and you hear them, and you think you've hit bottom. But there's people who have hit rock bottom. These people play slot machines and all that. I didn't want to be like them. A: I think 4-5 years ago, people were always like, 'Who do you have?' Someone said, 'sell your picks and stop giving them away for free.' I saw it as a business venture and I knew I could consult as another form of income. Q: What was your first major win? A: Three years ago. At the beginning of the NFL playoffs, the Ravens were 25-1 to win the Super Bowl. They were the highest seed in the playoffs that year with Joe Flacco. I bet $8,000 to win $208,000. And they beat the 49ers in the Super Bowl. It put me on the map. If you take a team as a long shot at the beginning of the year, the payouts are huge. Q: What's your day-to-day life like? A: It's tough, especially right now, because I have a lot of anxiety. I have so much riding on my futures pick. I've been checking updates every 15 minutes, injury reports, all that. Even if I get up in the middle night, I'll check ESPN.com or whatever. I go to bed 10-11 now, but I'm constantly studying. I watch every game. I watch 8 hours of baseball a day during the season. I have 17 TVs in my house. I'm a digital person. I watch tons of hours of games and do tons of research. Q: Who's your futures pick this year? A: In football, I take an AFC and NFC. I said Broncos, Cardinals and right now it looks good. I always do a back-up pick, with bigger odds, and I went with Kansas City and Green Bay. But right now if Arizona wins, it'll pay out $1 million and if Denver wins, it'll pay out $2 million. I'm hoping for Denver, Arizona, with Denver winning. Q: Wow. So, Denver and Arizona? A: Denver and Arizona. And Denver winning it. Q: When it comes to weekly picks, do you lose a bunch of games like a normal person? A: I played college and NFL and went 21-1. I'll have, like, one pick a week. Baseball is my best sport, as I picked the Royals (to win it all in 2015). Q: As a fellow MLB fan, I could've seen the logic. I feel like I would've argued with you, though. I get it, I could see them going back, but they lost a lot. What was it that made you stick with them? A: Number one, they were 7-0 to start the season, when everybody liked the Tigers. But the bullpen and defense win championships -- and the Tigers fall apart every year. The Royals made it the year before, were one out away, and that experience helps a lot. It was kind of a fluke that they were there. Yeah, they lost Shields, but it turned out Volquez put up better numbers. Even though Holland got hurt, their bullpen was very strong. Ventura was a wild card, and he was wishy washy all year, but at the All-Star break they got Cueto, I didn't hedge the bet. I knew they were all in. To me, 1-through-9 on the Royals, they can all hit. And the bullpen, they won every game after the seventh inning. Q: Do you have your futures pick this year? A: I dont give it out. But I know who it is. Q: Can I get a hint? A: I'll tell you right now, it's not the Chicago Cubs. That's who everyone thinks it's going to be. A: The team I'm looking at is about 10 or 15-1 odds to win it all. Q: Do you watch the NBA? A: Nah. I dont wanna mess with hoops. It comes down to the last two minutes. I'm not interested in it at all. A: Nope. Just football and baseball. But recently, I broke the record for a payout in UFC, picking Holly Holm. Then I picked (Conor) McGregor and that hit too. Q: Do you celebrate like crazy when you win? Or is it like, you act like you've done it and it's just business as usual? A: In the past when I didn't have a girlfriend, I went out. I was just in the New York Times as the biggest bottle-spender in Vegas. I'd spend 20 or 30 grand a night. Now, I'm 39 and i don't have interest in going out anymore. If i win, I'm happy and then two hours later, I'm fine. If I lose, I'll be pissed for 10 minutes, then I'll be fine. Gamblers have a short-term memory. I'm wired differently from a lot of people. Q: Do you plan on using this as a vehicle for other ventures? A: Everyone says I should go into commentary. I can predict better than those analysts on ESPN and stuff. But they can't afford to pay me what I want to make. Those guys make a couple hundred thousand a year, but i make that in a week. Q: Do you ever need a break from sports? A: No. I get hundreds of emails a day for picks from all over the world. I really never have an off switch. But I might take a trip. Maybe Asia. Or Thailand. Q: What are some things you enjoy doing aside from work? A: I like working out. I'm into cars. I just bought a new Ferrari and a new Bentley. I like nice dinners. I'm more of a homebody. I have a girlfriend now. It's hard to travel with the business I have, but I like to work out, go to dinner, hang with friends. Q: Do you have any allegiances with teams? A: No. I bet with my mind and not my heart. Every year it changes. The Royals will always be in my heart, though. I went to every World Series game, every playoff game and it was a great journey. I don't think they'll win it next year, but I'll always have a special place for them.